We’ve been focusing all our energy on improving the outside of the house (which I’ll be sharing next week!!! ), which means the inside has been just done up enough that we can use it and not have everything in boxes. We’ve lived here for less than three months but it already feels like home. With the house all tidied up for the party last weekend, it seemed like a good time to go around and document the progress we’ve made so far. I’m itching to get working on all the rooms once the cooler weather comes and start to make the inside look as nice as the outside is turning out! Come along for a tour of the place, but keep in mind these are real progress pictures so that I remember how it looked right now. LIVING ROOM, BEFORE: At 450 sq ft, this room is the same size as our entire apartment was. Seriously. We could have fit everything we owned in here and it makes me wonder how we lived in that cramped apartment for so long because now I’m so used to this space. LIVING ROOM, PROGRESS: Aside from getting the new couch and a coffee table my mother-in-law found, everything in here was from the old apartment or given to us by family. We’re planning to make or buy a new entertainment unit (we’re using our hallway bench for now) and the chair needs to be refinished too. And we definitely need to figure out the whole art situation. 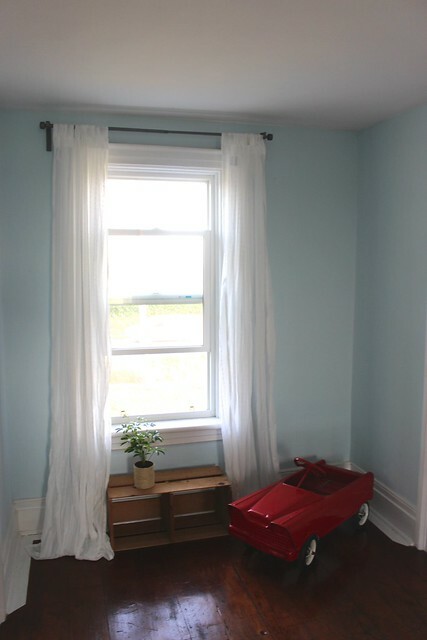 The curtains were ones that my mom-in-law found in her basement and they worked out great for this space for the time being until we figure out how we want to decorate this space eventually. BEFORE: Here you can see the other side of the room and the big space between the windows where the original fireplace was. We’re planning to put the new entertainment unit there. PROGRESS: For now we have our old bookcase over on the far wall, but eventually we’d like to do a fireplace and built-in bookshelves on that side. On the right is the other chair I’d like to refinish. It was a garage sale steal for $15 including the foot stool (which has really cute legs under that skirt). On the bookshelf I’ve just propped up these two vintage reproduction posters I picked up for $2 a piece at Heritage Park in Calgary and popped in these frames from IKEA. Eventually I’d like to move these to our mudroom. KITCHEN, PROGRESS: When you turn left from the back of the living room, you walk through the kitchen. 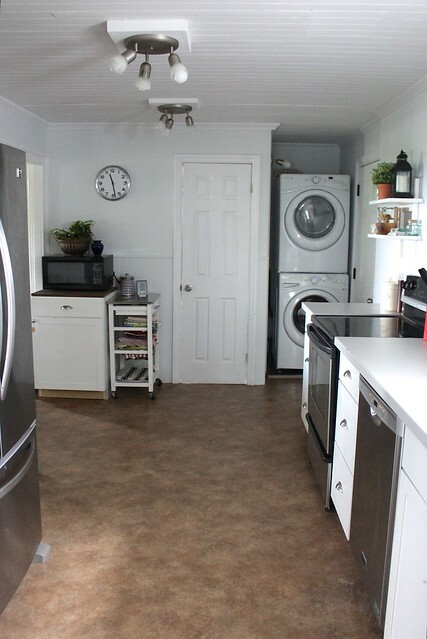 At the back of the kitchen is our new washer and dryer. I don’t know how we lived without laundry in the house before. I love it! 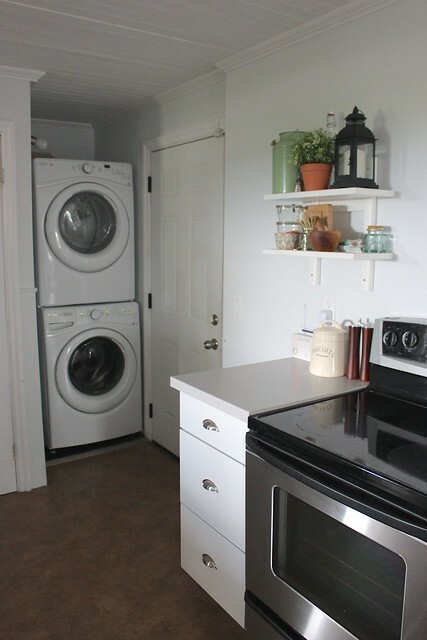 The back door to the mudroom is right off the kitchen too, with the powder room to the left of the laundry. To the left of the powder room is the extra cabinet we took out to put the dishwasher in. There was no counter top for it…but then I flipped over two of the stained wood signs I made for the wedding and they worked out perfectly as a makeshift countertop for now that cost us nothing! 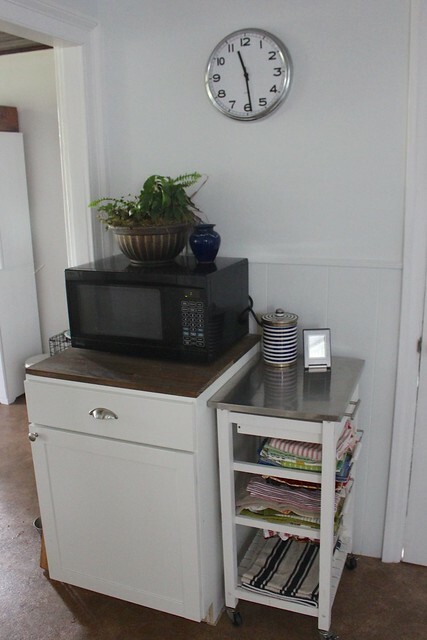 The kitchen cart is from the old apartment and holds all our teatowels and my linens I use for food photography props. 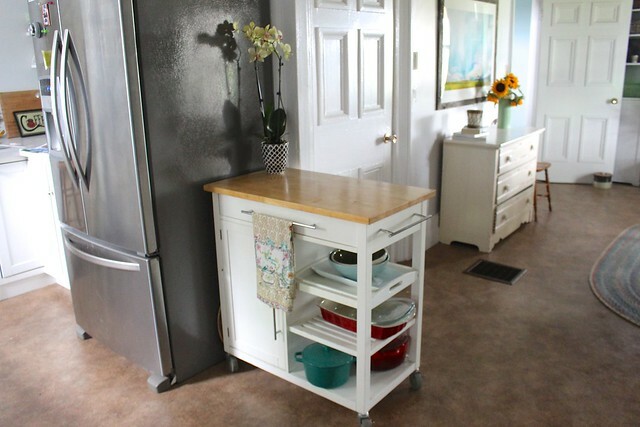 When you turn back you can see our other kitchen cart for storing baking supplies, and the entrance to the dining room. 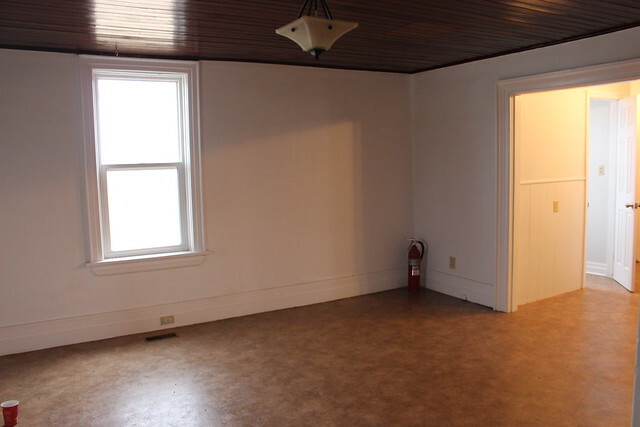 The door on the right is to the front hall and the one in the centre is to the basement. The kitchen is the only room in the house that had been updated before the previous owners sold it and I’m so glad they did it. It is a great space and we love it right now. In the corner we’ve set up a little baking and coffee station. I never thought I’d like having open shelves but now I love them! 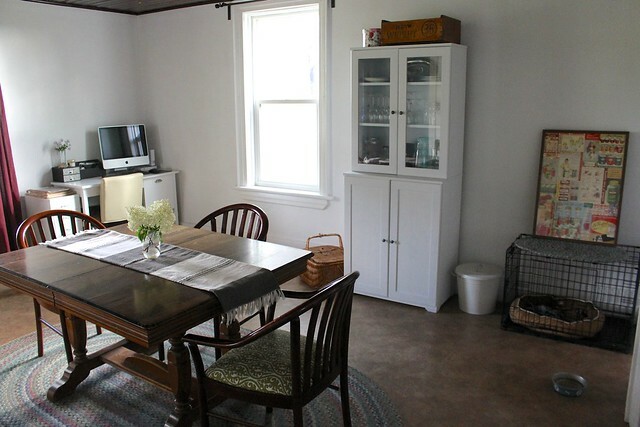 As great as this space is right now, eventually we’d like to switch the kitchen and dining room. 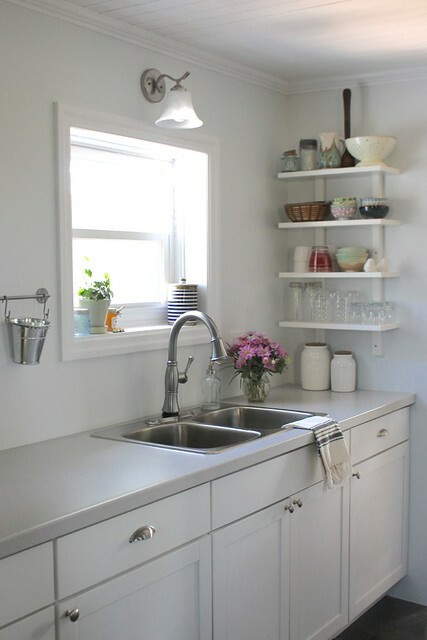 There is surprisingly less storage space in this kitchen than in our old tiny apartment kitchen. We’ll be able to reuse all the cabinets and just add upper cabinets, an island and countertops. MUDROOM, PROGRESS: Back through the kitchen (the door is on the left) is the mudroom. 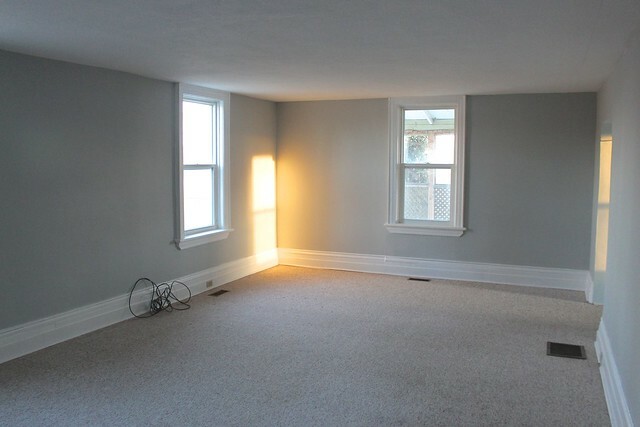 I can’t wait to start painting this space soon. 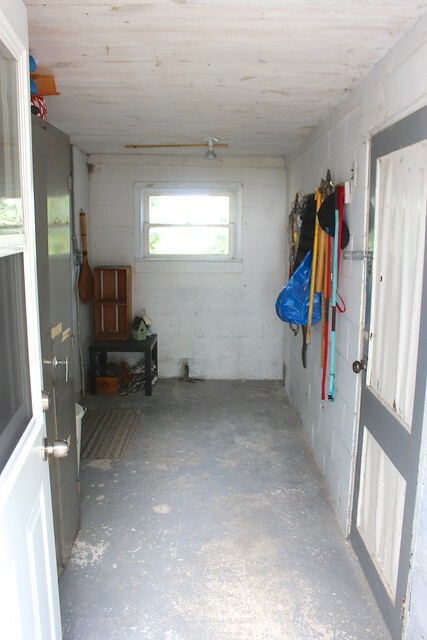 We’re planning to add in shelves, hooks and eventually a new door on the opposite wall to turn this into a breezeway. On the right is the door to the garage/home gym. 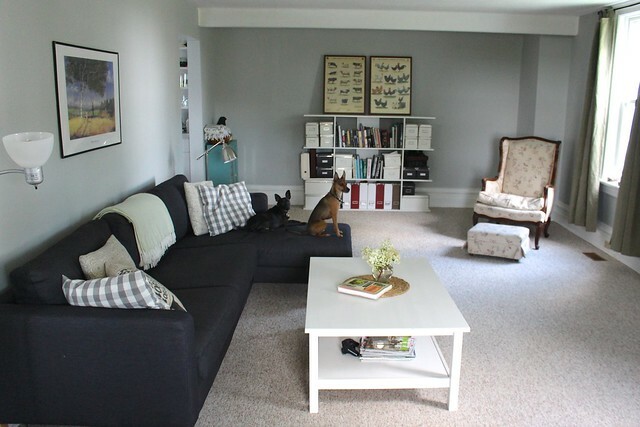 As much as this space lacks in style, it has been a big help when we’ve been renovating this summer. 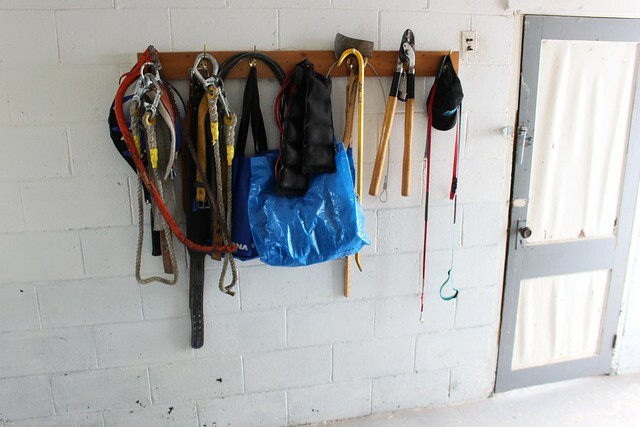 We’ve been able to store all the tools and supplies in the big cabinet there and hang our tools. 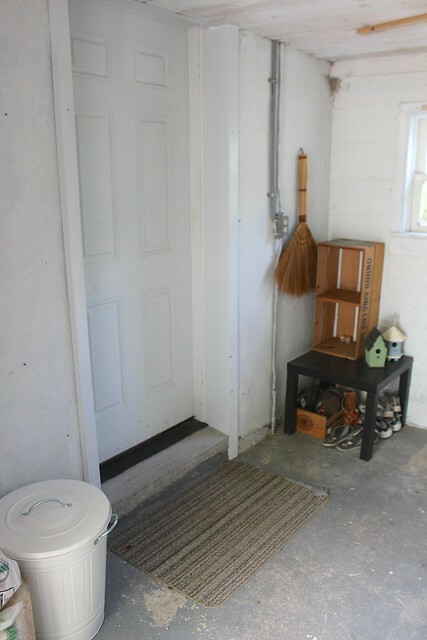 We use this door as the main way into the house, with the chicken food in the pail on the left and all our summer shoes tucked in on the right. 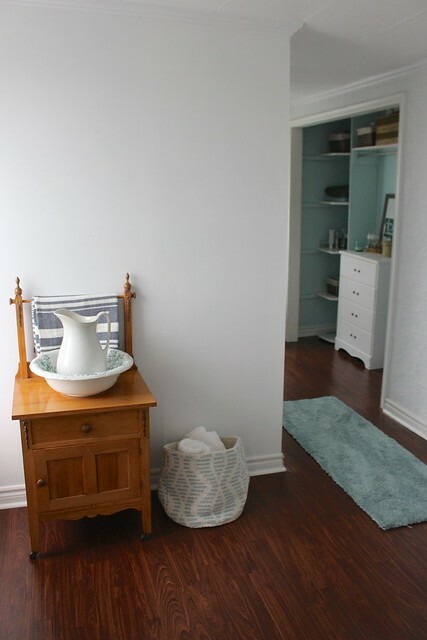 The plan is to turn this into a nice mudroom so that if guests come through this way (instead of the front door), it still looks inviting. 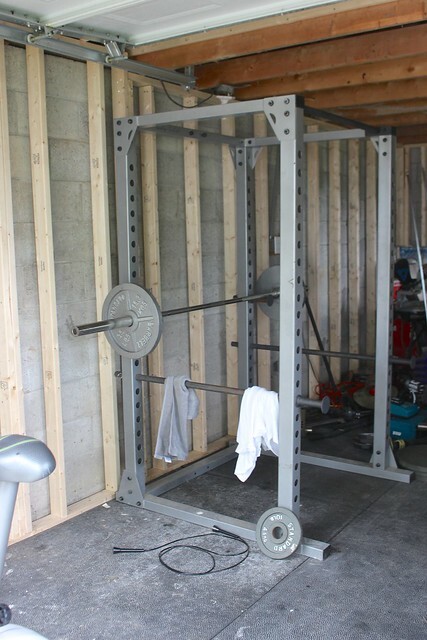 GARAGE/HOME GYM, PROGRESS: Through the door in the mudroom, you can reach the garage, which is the future home of our gym! Garrett and his dad worked hard to level the concrete floor and we had a carpenter come in to frame the room. This fall we will be insulating and drywalling it so that we can use it all year round. 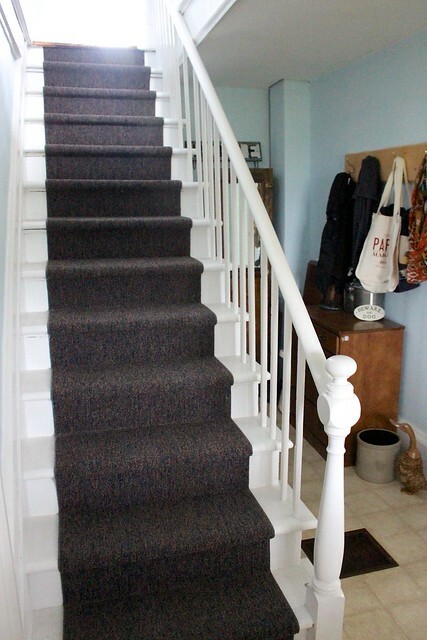 Thankfully we already have our equipment and some big heavy horse mats Garrett picked up for the flooring. Even with all the construction going on around it, we’ve been able to use it this summer, with the door open looking out into our backyard. For less money than our annual gym memberships, we’ll be able to turn this into a pretty nice home gym! POWDER ROOM, PROGRESS: Back inside, to the left of the laundry, is our little powder room. It’s one of the rooms that needs the most work right away. 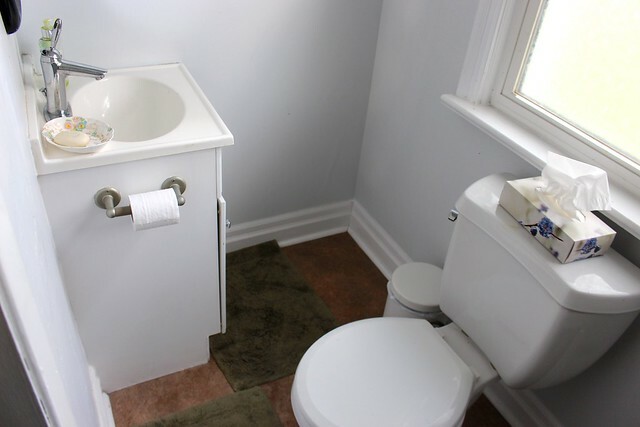 It’s the bathroom that guests use and the layout and fixtures are not so great. 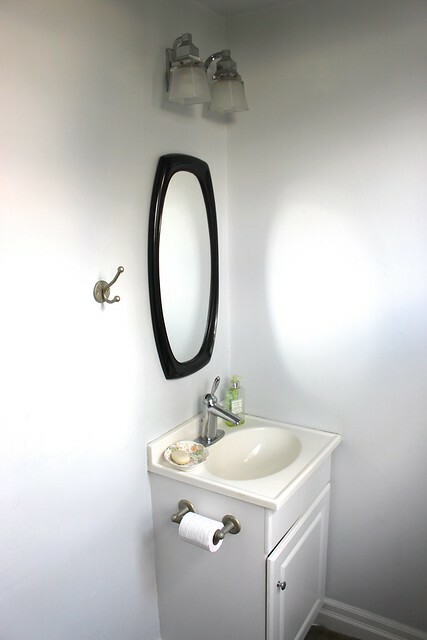 There is barely any room to get around the toilet to the sink. 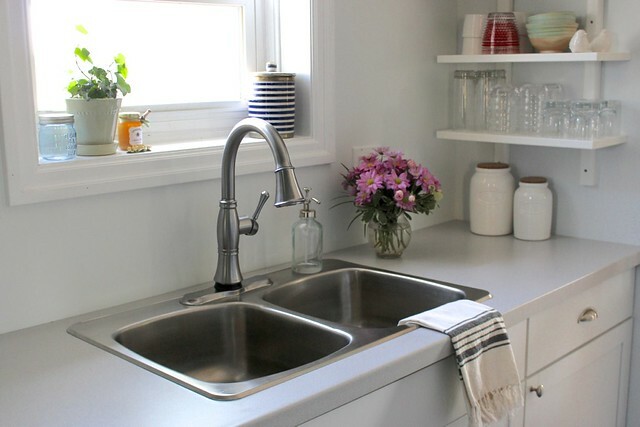 The sink itself is in rough shape too. 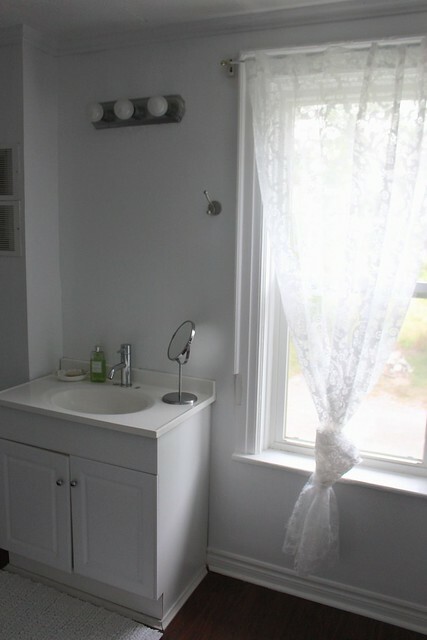 We have a replacement pedestal sink already that we plan to use for this room. 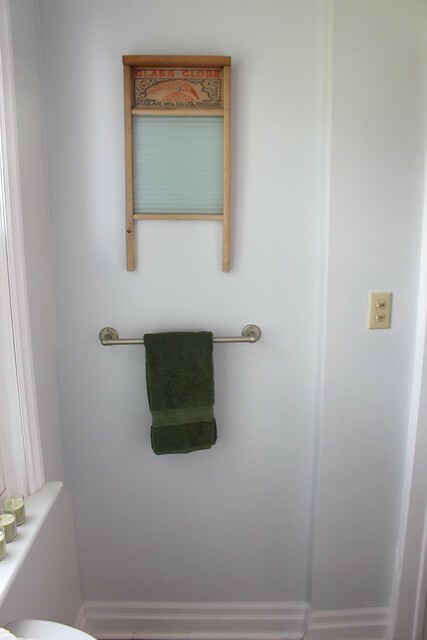 On this wall we’ll put the toilet, with shelving above. 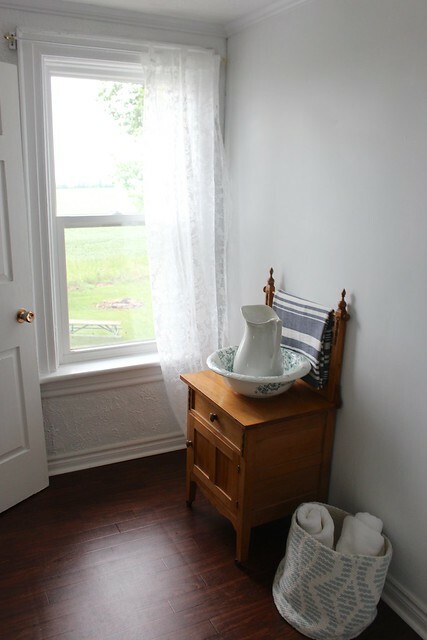 On the opposite wall (by the door), we will put the new pedestal sink and an antique mirror when we do the renovation. 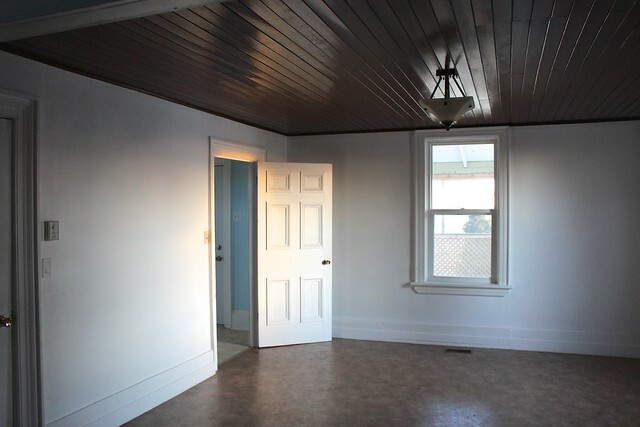 DINING ROOM, BEFORE: The tongue and groove ceiling in this room was one of the things that sold us on this house. The plan is to turn this into the kitchen someday. DINING ROOM, PROGRESS: We were able to use our old dining room table and tuck my desk in the corner. My mom has lent us the old dresser from my great aunt’s farmhouse to use as a buffet. Behind the door is a new cabinet we bought at IKEA to store all our computer parts and craft supplies. BEFORE: You can see the powder room door in the kitchen on the right. This wall is where we’d eventually move the kitchen cabinets, stove and fridge, with a big island in the middle. 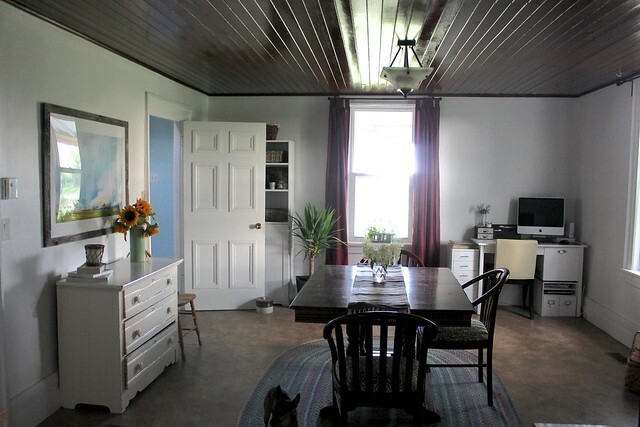 PROGRESS: The braid rug under the dining room table is from my parents’ house and fit in great with the farmhouse decor. 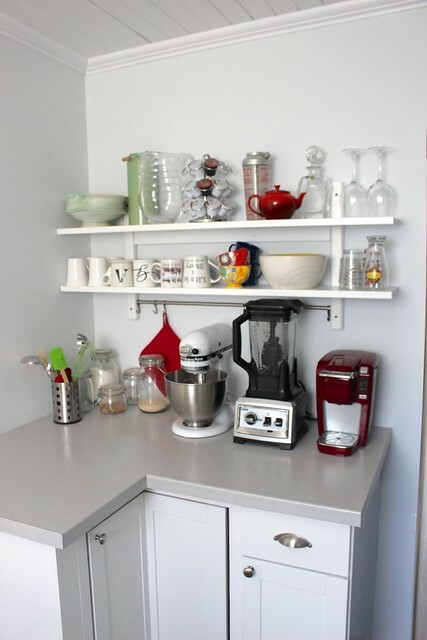 The cabinet along the wall is another IKEA find that we’re using as a bar and storage. Cola’s dog crate is tucked away on the right for when we leave for work, with another bin beside it for dog food storage. 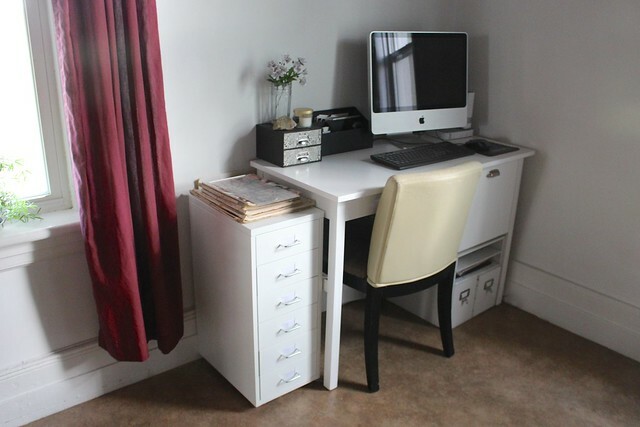 I haven’t quite figured out how I want to setup my desk area, but for now we’ve tucked it in the dining room. 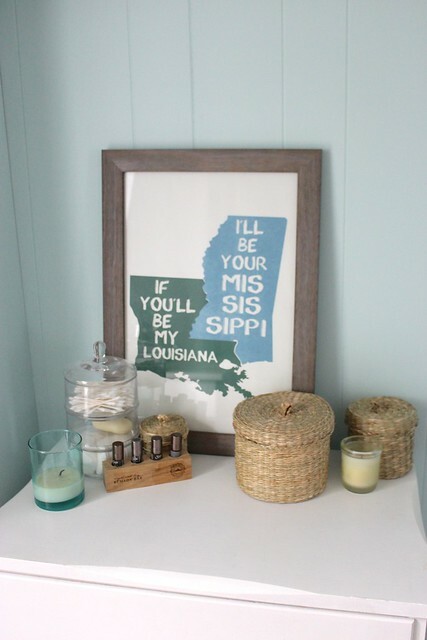 When we’re ready to switch the two rooms, this might go up to the guest room. 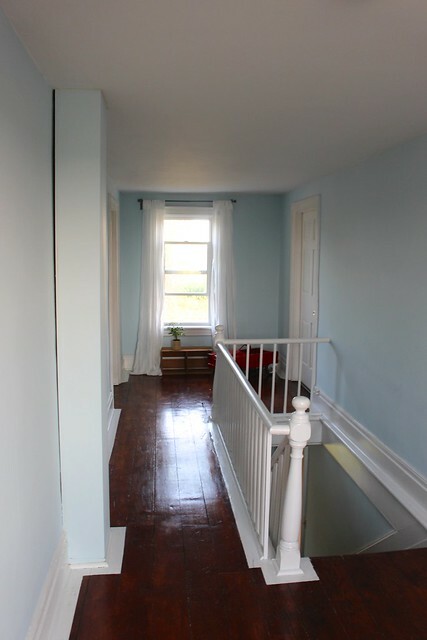 FRONT HALL, PROGRESS: We haven’t done anything with this space, aside from setting up an armoire and dresser for storing shoes and winter clothes. Eventually we’d like to reopen the hallway into the future dining room. For now we’re planning to take down the hooks the previous owners put up here and replace it with nicer ones we have. UPSTAIRS HALLWAY, PROGRESS: The biggest change we made in the hallway was to hang up curtains on the windows at each end of the hallway. By the window at the front of the house, we put my very first car – a red convertible no less! My dad dug it out of their basement and surprised me with it one day. 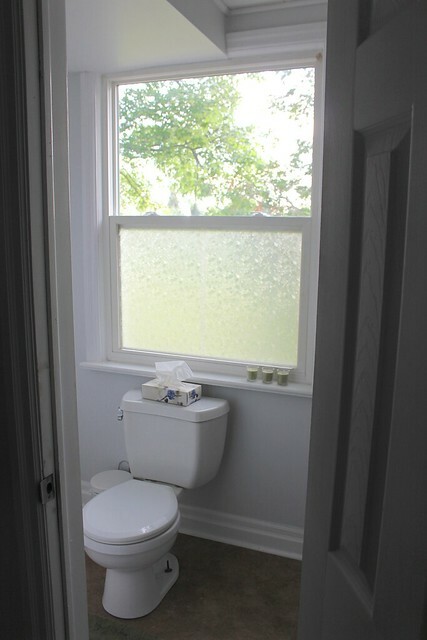 BATHROOM, PROGRESS: The layout of this room confuses people every time. You come in through the doorway to see this, and then go around the corner to see the tub and toilet. The washstand is an heirloom from both sides of Garrett’s family. His one grandfather refinished it and sold it to his other grandfather. My mother-in-law found this wash basin and pitcher that fits it perfectly. When you go around the corner, there is a large closet from when this was once a bedroom. 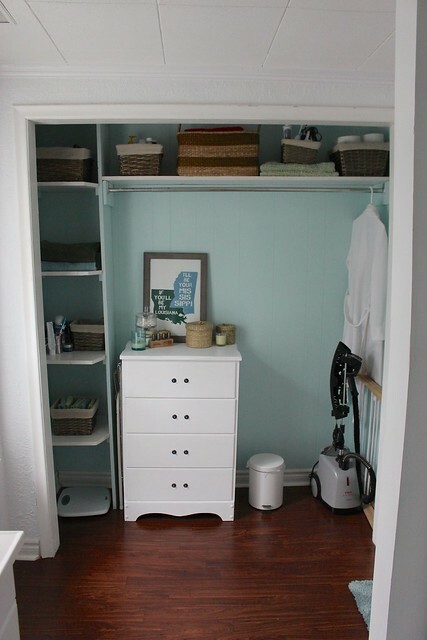 We’ve used the shelves as storage for now, with a dresser to hold toiletries. Eventually we’d like to put up a door or curtain here. 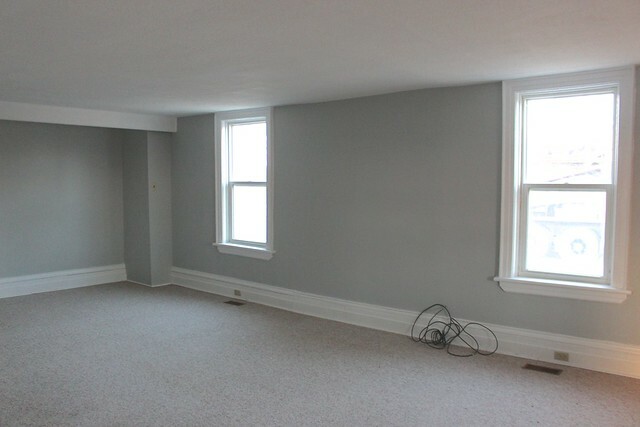 I’m trying to go with cool, serene colours in this room to make it really relaxing. 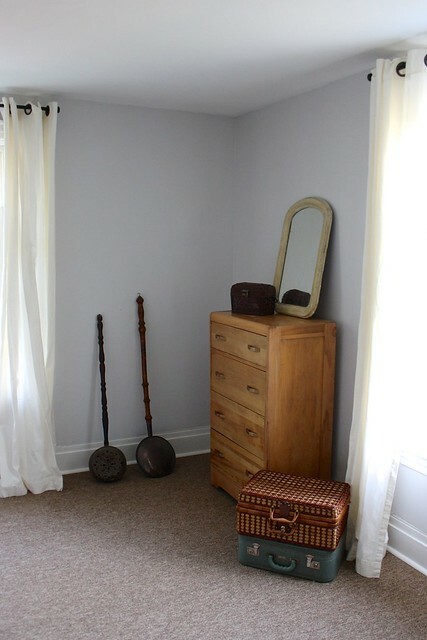 There is no mirror in this room (and we had to add the one to the powder room too), so we’re on the lookout for something to work in this space. 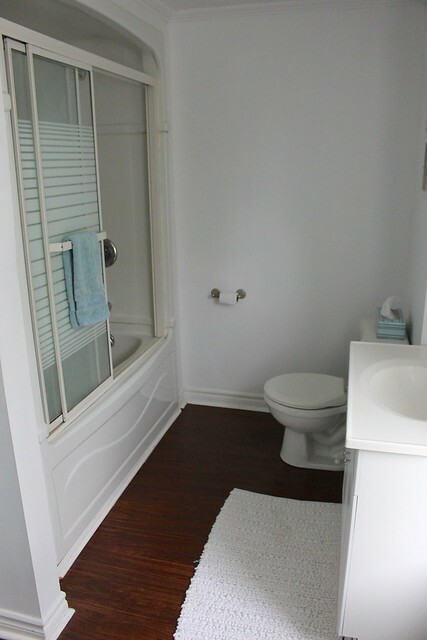 Here is the shower, toilet and sink around the corner. 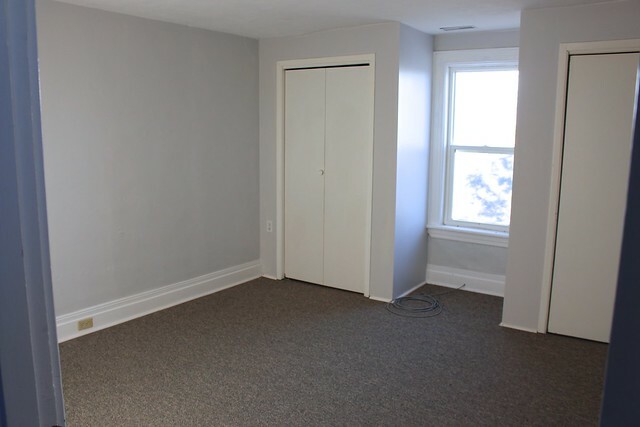 This is definitely a room that we plan to update. 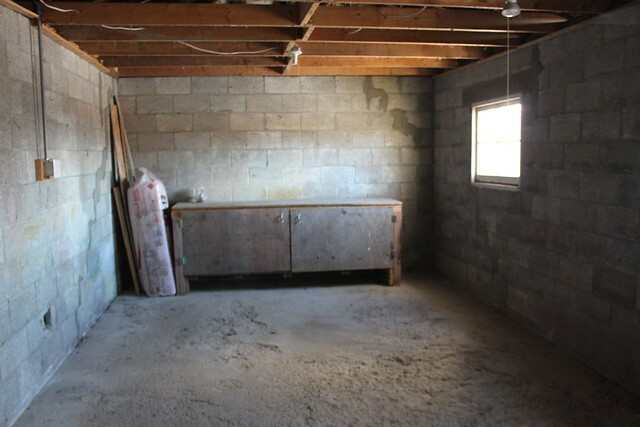 There is so much unused space here and we could make it into a really nice bathroom. GUEST ROOM, PROGRESS: Our old bedroom set is now in our guest room at the end of the hallway, with some old dressers and nightstands from my parents’. The other spare room is currently being used as storage by my sister while she waits to move into her new apartment next month. 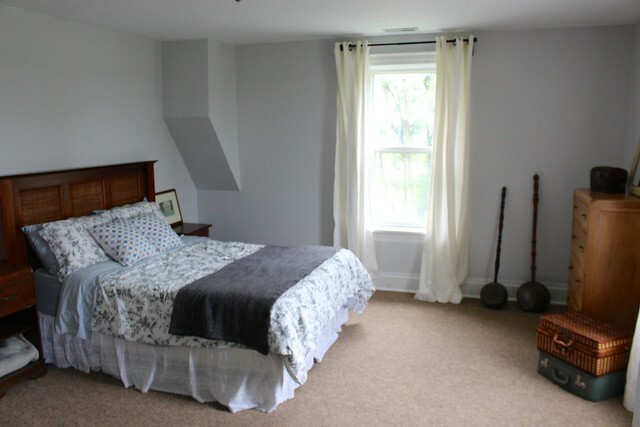 The pans hanging out in the corner are antique bed warmers our family friends’ brought over from England. 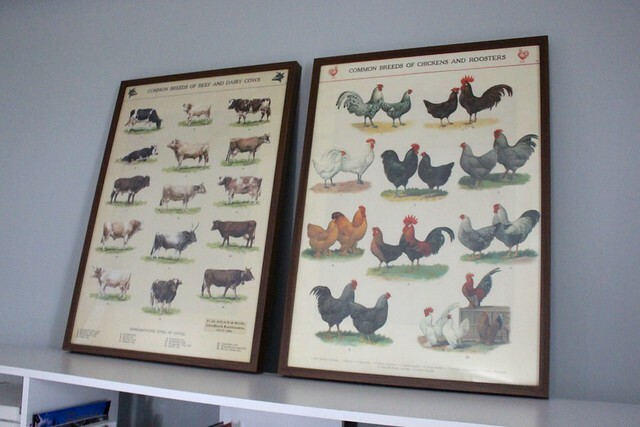 I’m thinking about hanging them up on the wall. MASTER BEDROOM, BEFORE: When we first toured the house, I knew this would be the best room for our bedroom. It’s the smallest, but it has two closets, a window space for the dog’s window seat and is the darkest room for sleeping. 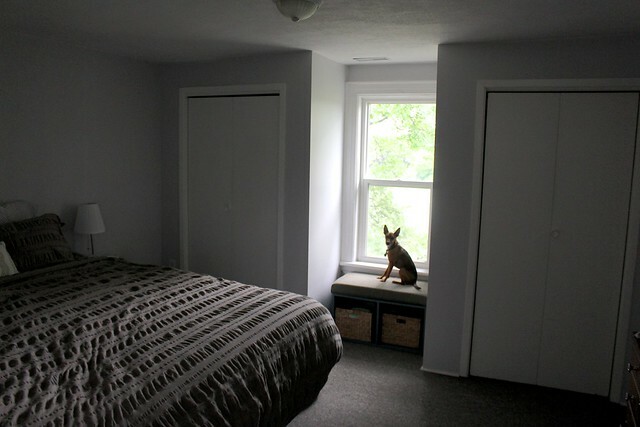 MASTER BEDROOM, PROGRESS: Aside from moving in our new bed and setting up the dog’s window seat and our dresser, we’ve done nothing to this space. We’ve got a plan for the headboard and a wall treatment we’ll take on this fall. 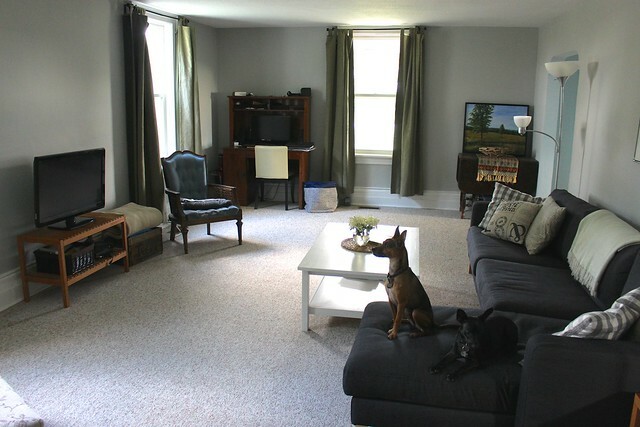 I can’t wait to make some headway in this space and turn it into a relaxing retreat after a long day of work. Thanks for stopping by for a small tour of the farmhouse. I hope you can see where we’re heading with this and follow along as we make more progress on it this fall/winter! Its looking wonderful. I’m loving it. It’s exciting to see it come along. Sometimes I feel like we haven’t done much and then I look at the pictures and it’s encouragment to keep going!